Being a multi-purpose skill, mastering Magic is beneficial for both your combat and every day needs. With three spellbooks to choose from and 135 different spells, it's one of the most varied and useful skills in the game. 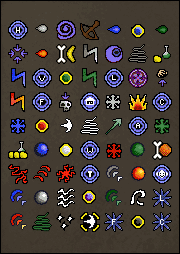 As with many skills in the game, Magic is related directly to the Runecrafting skill, which, if you choose to develop, will potentially save at least 50% of your money spent on runes and can provide nice income regardless. To save time of course, you can always buy runes from the Grand Exchange or from shops scattered around RuneScape. If you still want to save some money on runes, but don't have the Runecrafting level or patience to work on it, you can accompany someone with a high Runecrafting level and ask for assistance from him. 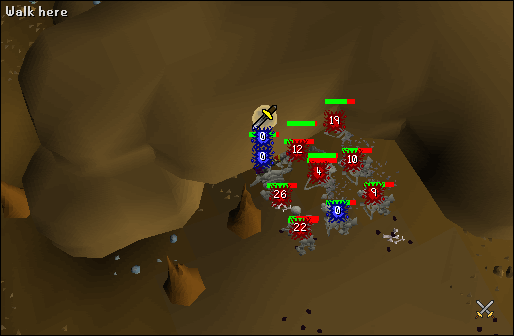 Players usually won't refuse to help you as Runecrafting exp is a product in very high demand. The unfortunate fact is that the free-to-play Magic skill pretty much reaches its potential at level 59. While any extra levels will increase your chances to successfully hit a target with your battle spells, or avoid being hit by a magical attack, it's much inferior to what the Members world offers. Killing things is the main use for the Magic skill in these first few levels, upgrading the spells along with your levels and throwing in the stat-reducing spells (Confuse, Weaken and Curse) every now and then. 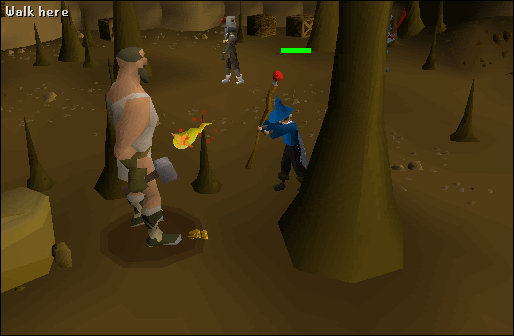 There is no specific level monster that you should train on since each one has a different resistance to magic, but in most cases the rules that apply in melee will work here: Starting small with creatures such as men, goblins and rats, and working your way up through guards, hill giants, skeletons and even the popular level 82 Lesser Demon. It's recommended to train a few more levels than necessary on your current target before moving on to a stronger foe, since a higher level means more accuracy and thus less misses and wasted runes. An important thing to note is the new magical equipment that can be obtained from the Fist of Guthix Activity. At level 20 Magic you are able to wear the Combat robes. 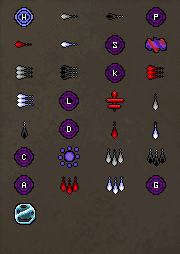 While wearing the full set, apart from giving you the best Magic bonus in the F2P world, they also have a chance of providing either mind, chaos or death runes when casting a spell. Fastest method: Using the highest level spell available. Economic: Roughly 60 Wind, 50 Water, 70 Earth and 2,500 Fire Strike casts (a total of 2,680 Mind, 5,180 Air, 50 Water, 140 Earth and 7,500 Fire runes). Fastest: Roughly 60 Wind, 50 Water, 70 Earth and 70 Fire Strike casts, 150 Wind, 220 Water, 350 Earth, and 570 Fire Bolt casts, and 240 Wind Blast casts (a rough of 250 Mind, 1,290 Chaos, 240 Death, 4,190 Air, 490 Water, 1,190 Earth and 2,490 Fire runes). 60 Wind, 50 Water, 70 Earth and 2,500 Fire Strike casts. 60 Wind, 50 Water, 70 Earth and 70 Fire Strike casts, 150 Wind, 220 Water, 350 Earth, and 570 Fire Bolt casts, and 240 Wind Blast casts. Often ignored as a training option (as well as a useful spell overall) due to the need of nature runes, the Superheat Item spell is your fastest way to train the Magic skill from this point on, assuming you have a level 30 Smithing. The process includes buying or mining iron ore and coal, and smelting them into steel bars using the spell. The great advantage of this spell is its fast cast rate - twice as fast as High Alchemy. The disadvantage however, is that unless you mine at least half of the coal required, you will be losing money. It's worth noting that if money isn't an issue, iron ore might provide faster exp as there's less banking hassle. A cheap (though slower) alternative to this method is to keep killing things with the Fire Strike spell. By now your level should make up for the relatively low damage with more frequent hits. Fastest method: The Superheat Item spell. Economic: Roughly 6,000 Fire Strike casts (a total of 6,000 Mind, 12,000 Air and 18,000 Fire runes). 6,000 Fire Strike casts. 2,200 Superheat Item casts. At level 55 you are finally able to cast the notorious High Alchemy spell. As hinted before, this spell competes with the Superheat Item spell: Though fairly slower, the High Alchemy spell grants more exp per cast, and more importantly, turns the item it's being cast on into gold. The main disadvantages are its slow cast rate and the F2P items alchemy value. If you can afford it, it's recommended to carry on with the Superheat Item spell until your goal. Otherwise, the High Alchemy spell has already been proven. As with the previous goal, killing monsters with the Strike and Bolt spells poses the cheapest alternative, but at a more time consuming matter. Recommended method: The High Alchemy spell. The pay-to-play world offers a lot more uses for the Magic skill in the form of equipment, Activities, transportation and combat. However, the very best spells are only available to the very best mages and here you will be shown some of the recommended ways to become one. It's recommended to read the F2P leveling up section before moving on. Just like with the F2P training, the first levels will be dedicated to familiarizing yourself with the Magic skill combat abilities and style. There is of course a wider selection of monsters to train on, but the method remains the same: Start small, advancing with the monsters according to your Magic level. You can, again, use the Combat robes from the Fist of Guthix Activity to spare you some runes. 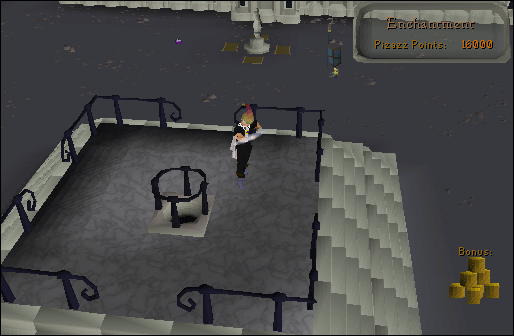 At level 33 it's worth noting that you can now fully access the Mage Training Arena, and while there is no practical use for it (in terms of exp and the rewards it offers) until level 50, it will play a major role of your training in due course. At level 40 you can wear the Mystic robes (assuming you have a level 20 Defence). Bought from other players or from the Grand Exchange (see the Item Database for current prices), these robes will greatly increase your chances for a successful hit with the combat spells. If you still using your Combat robes, and can afford to upgrade to the Mystic set, it's recommended to do so as the set's Magic bonus should compensate for the runes lost by higher and more frequent hits. Casts/runes needed: See F2P section table. The Superheat Item spell returns for a quick appearance and should offer a swift jump through these levels, as nature runes can be obtained for free (mentioned in the Obtaining Runes section above). Alternatively, in the lack of time, or if you simply enjoy it, you could battle your way to 45 instead. Economic: Roughly 600 Fire Strike casts (a total of 600 Mind, 1,200 Air and 1,800 Fire runes). Fastest: Roughly 200 Superheat Item casts (a total of 200 Nature and 400 Fire runes). 600 Fire Strike casts. 200 Superheat Item casts. This is where the P2P benefits of the Magic skill kick in. At level 45 Magic you are able to cast the Camelot Teleport spell. The great advantage here is that law runes can be obtained for free. The Superheat Item spell is still faster, but at the cost of more hassle as you'll need to buy nearly 2,000 iron ore and twice than that in coal. Combat spells are still a good option although quite time consuming compared to these methods. 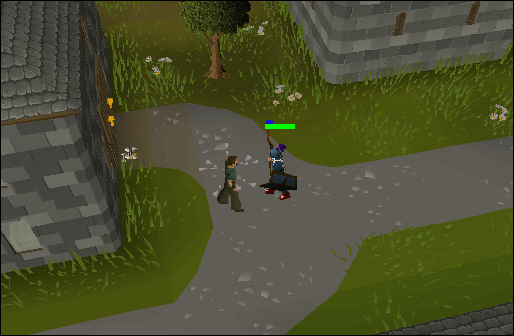 If you get bored half-way through, keep in mind that at level 50 you are able to cast the Snare spell, which can be put to good use over the Castle Wars Activity (if you can spare the runes). Recommended method: The Camelot Teleport spell. Superheat Item: Roughly 1,900 casts (a total of 1,900 Nature and 7,600 Fire runes). Camelot Teleport: Roughly 1,800 casts (a total of 1,800 Law and 9,000 Air runes). The very well-known High Alchemy spell may now replace the Superheat Item method until the next step. It will take more than a few casts to gain the exp you'll need for the next goal, so taking it slow would be best for your nerves. At level 60 you are able to wear the Battle robes, which can be obtained through the Fist of Guthix Activity Apart from a very impressive Magic bonus (in par with the Third Age robe set), wearing the full set has (apparently) a good chance of providing either mind, chaos, death or blood runes when casting the battle spells. The robes, however, require quite a considerable amount of FoG tokens to be repaired, which leaves you the decision of whether using them or not. At level 66 you'll discover that you have unlocked the Vulnerability spell, which you can use if you can afford the Soul runes and sick of the High Alchemy or the Superheat Item methods. The procedure includes casting the spell while wearing equipment that reduces your magic attack bonus. Superheat Item: Roughly 8,000 casts (a total of 8,000 Nature and 24,000 Fire runes). High Alchemy: Roughly 6,500 casts (a total of 6,500 Nature and 32,500 Fire runes). Vulnerability (at level 66): Roughly 1,400 casts (a total of 1,400 Soul, 7,000 Water and 7,000 Earth runes). Level 68 is a milestone in the Magic skill and the time for you to finally taste some of the high level spells and equipment. It's also worth noting that from this point on you'll need to spend fair amounts of money, whether on runes or rune essence. The Mage Training Arena (that from this point on will be referred to as the 'MTA'), can finally offer relatively high exp, and its rewards should serve you nicely for this goal, whether it's for profit or personal use. Also, if you're yet to discover it, the Desert Treasure quest can offer you new powerful combat spells which are less practical in day-to-day combat, due to the amount of runes required per cast, but useful nevertheless. Three and a half million exp isn't something you gain in a blink of an eye, so it's important to try and make these levels as varied as possible. With the availability of the Lvl-5 Enchant spell, you can now gain tremendous amounts of exp in the Enchantment room over the Mage Training Arena (even though the spell gives only three quarters of its regular exp). That, combined with the rest of the chambers and with an Infinity item wish list, can provide around 20% of your total exp for this goal. For example, if you choose to work toward the Mage's Book, Master Wand and the Infinity Boots, which are all currently the best mage equipment in the game (of their assigned slots), you will earn roughly 540,000 exp - elevating yourself to level 74. In between your MTA sessions, you can enjoy a few games of Castle Wars, hunt metal dragons or even try your luck over the Barrows Activity - all providing nice exp while having fun and earning a dime. You could also return to the good old Superheat Item spell, but instead of selling the steel bars you produce, smelt them into Cannonballs and sell these (making it a good way to fund your runes). It's worth noting that there're faster (yet somewhat generic) alternatives to the methods above. The MTA Enchantment room can provide excellent exp regardless of the Arena rewards - around 60k can be achieved per hour by picking the same shape and recasting the spell on it, ignoring its bonus status. At level 73, the Enfeeble spell can produce even more exp-per-hour at the cost of Soul runes, and your tolerance towards Random Events as well as constant 2-way mouse movements. This method can also be upgraded at level 80 using the Stun spell. At level 82, assuming you've completed Desert Treasure, you are able to cast the Ice Blitz spell. 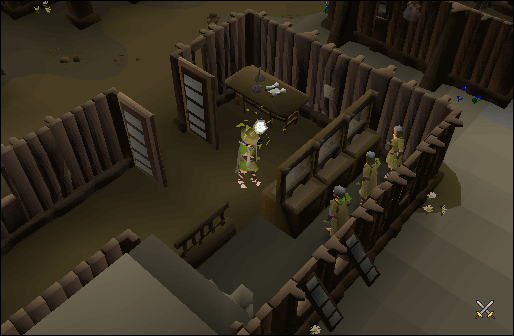 If you have delayed your first experience with the Barrows Activity, this is a good time to start it, as it can provide fair amounts of exp for the persistent treasure hunter. 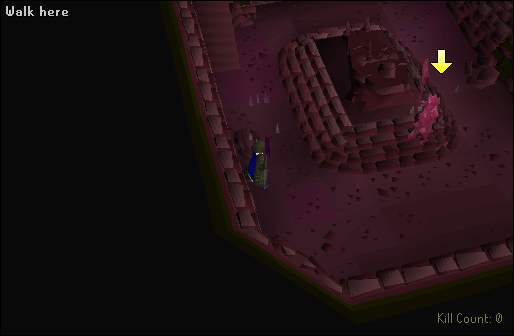 Without going into a lot of explanations (which can be found in the Barrows Activity guide), the procedure includes casting the Blitz spell on your target once, hitting it another 4 times with the Burst, and running to a safe-spot, repeating the process. 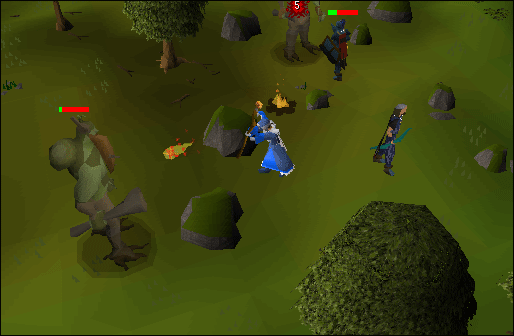 As mentioned in the very beginning of this guide, mages who chose to work on their Runecrafting skill will find this way very profitable, as you will only need to buy pure rune essence or small amounts of Blood runes. Fastest method: The Lvl-5 Enchant spell. Recommended method: Do various things. At level 87 you're finally able to make use of the best training method in the game. Nearly 6 million exp however is not an amusing fact, and these levels are best planned ahead in the form of required runes and the time you're willing to spend on the matter. On the more positive side, you have only 15 spells to unlock, among them are the fearsome Ice Barrage, and the Lunar spellbook's Vengeance and Spellbook Swap. From this point on, your quick exp method will consist of the Lvl-6 Enchant spell cast in the way mentioned earlier over the MTA. The spell gives a staggering 72.5 exp per cast inside the arena, and once you get used to it (which by now you probably are), it is possible to cast it 1050 times per hour, granting you over 75k exp. You'll notice that every 20 orbs you deposit, you get either 3 Cosmic, 3 Death or 3 Blood runes. You will get 50 runes of each type every 1000 orbs, and while it doesn't seem much now, it will eventually build up to a few thousands without you noticing. Fastest method: The Lvl-6 Enchant spell. Recommended method: The Lvl-6 Enchant spell. Casts/runes needed: Roughly 78,000 Lvl-6 Enchant casts (a total of 74,000 cosmic, 1,500,000 earth and 1,500,000 fire runes). 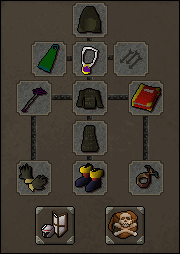 The only goal left from this point on is the Magic skill Cape of Accomplishment. You'd naturally want to take a nice break from the MTA, and with all three spellbooks available without the need to go to an altar, there's plenty of things you can do. The Lvl-6 Enchant spell is still your fastest way to gain exp, but keep in mind that with such high level spells, you'll be gaining plenty of exp just by doing day to day tasks and working on other skills (Farming is a good example, as well as Crafting, high level Construction and even Runecrafting). Casts/runes needed: Roughly 46,000 Lvl-6 Enchant casts (a total of 44,000 cosmic, 900,000 earth and 900,000 fire runes). 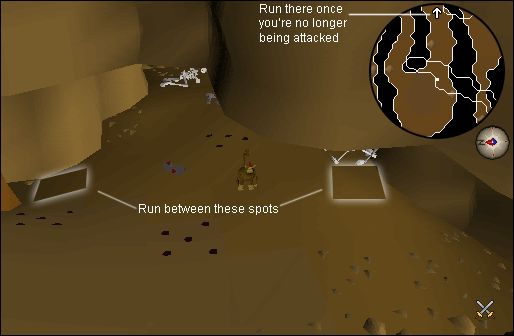 Based on the same concept as the Ranged Red Chinchompa training, this method allows you to gain over 150,000 Magic as well as 75,000 HP exp per hour. Such generous exp comes at a price however, and you must be able to buy a lot of runes as well as potions and equipment. Completion of the Monkey Madness and the Desert Treasure quests. At least level 50 Prayer (the higher the level the longer you can stay). A prayer book of any god (an Unholy Book would be an advantage as it adds magic bonuses). A god cape or a god cloak. A pair of 'Barrows', Infinity or Mystic gloves. 3rd Age, Fury or Glory amulet. Sufficient runes for your planned staying time (mentioned below). 2 pieces of food (sharks or tuna potatoes). A Holy Wrench (obtained upon finishing the Rum Deal quest). 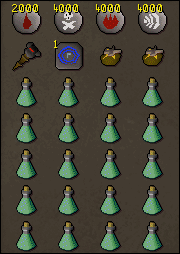 An inventory full of prayer potions. The spell you'll be using is the level 86 Smoke Barrage. The reason this spell was chosen is due to its high damage, non-freezing qualities and the fact that at level 86 your spells have a very high chance to hit multiple targets. Firstly, you'll need to get to the Skeletons part of the dungeon, so turn yourself into a monkey and climb down the ladder into the dungeon. Take the northern route, hiding under the ledge every now and then to avoid taking damage from the collapsing ceiling. Once there, familiarize yourself with the marked areas in the picture as you'll need to run between them every few seconds to get a nice 3x3 grid of targets. 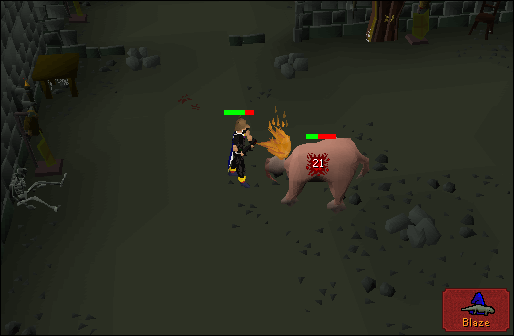 Once you're ready, turn on your Protect from Melee prayer, wield back your staff and set it to autocast. You'll notice that the dead monkeys drop bones. Do not pick them up as these will transform back into living (sort of) targets and attack you along with the ones that respawn regularly. It's a good practice to run between the marked safe spots every 15-30 seconds to make sure you've at least a 2x3 grid to attack. Eventually, the monkeys will stop being aggressive and you'll need to run to the far eastern end of the section and come back. You'll use around 900-1000 casts per hour. Keep a close eye on your prayer - if your prayer runs out while you're running, you will most likely get killed. There's no need to hurry - take your time hiding underneath the ledges when getting there to avoid the poison spikes and falling debris. Similar in terms of exp to the Ape Atoll Dungeon, this method uses the Lunar spellbook's String Jewelry spell and thus requires the completion of the Lunar Diplomacy quest. While it lacks the bonuses of multi-target combat, the advantages of this method are its relatively affordable price and little hassle. The process consists of casting the String Jewelry spell with an inventory of unstrung amulets. The spell only requires one click to begin and will automatically string every amulet in your inventory - one by one, using one set of runes for each amulet and giving magic exp accordingly. It's possible to string up to 1,800 amulets an hour, granting nearly 150,000 exp. To avoid spending awful amounts of money, it's recommended to buy gold bars (which are always in great supply, due to being a by-product of another training method) and smelt them to plain gold amulets in your preferred furnace. The Humidify spell is a slow yet free and even profitable way to train the skill, although it requires the completion of both the Lunar Diplomacy and the Dream Mentor quests. The procedure involves buying empty vials, and filling them using the spell, a full inventory at a time. Around 14,000 vials can be filled in an hour, which grants 35,000 exp. The advantage as mentioned, is the fact that you can make fair amounts of money with this method. For example: Assuming you resell each vial for 15 GP more than you've bought it, you can grossly make 210,000 GP. Salamanders aren't a good method to train Magic in general, due to the fact that each magic damage point is worth only 2 exp. Their main advantages are the ability to hit magic-resistant foes without wearing magical equipment, and provide HP exp as well as Magic. With dedicated training it's possible to gain around 20,000 Magic and 13,500 HP exp in an hour with the Black Salamander. Keep in mind that each salamander has different combat requirements and that they require ammunition. The salamanders also occupy both of your hands (2-handed weapon). It takes nearly 2,200 PC points to gain a magic level solely by the Activity and thus not recommended. It's worth mentioning however that a Void Knight set along with a Mage Helm will increase your chances to hit by 30%. 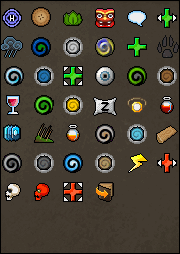 20 (with 10 Defence): Ability to wear the Fist of Guthix Druidic Mage and Combat robes. 33: Full access to the MTA. 40 (with 20 Defence): Ability to wear Mystic equipment. 50 (with 25 Defence): Ability to wear Infinity equipment; ability to cast the Magic Dart spell (with 55 Slayer); Magic requirement to start the Desert Treasure quest. 55: Ability to cast the High Alchemy spell. 58: Ability to cast all of the Rush spells (Ancient spellbook). 60: Ability to obtain and wear a god cape from the Mage Arena and cast the god spells; ability to wear the Fist of Guthix Battle robes (with 50 Defence). 65: Magic requirement to start the Lunar Diplomacy quest. 66: Free access to the Wizards' Guild. 80: Ability to activate the Charge spell. 82: Ability to cast all of the Blitz spells (Ancient spellbook). 83: Ability to cast the Fertile Soil spell (Lunar spellbook). 94: Ability to cast all of the Barrage spells (Ancient spellbook). 95: Ability to cast every spell in the standard spellbook. 96: Ability to cast the Spellbook Swap spell (Lunar spellbook). 97: Access to cast all spells in the game. Don't hesitate on experimenting with the skill. Magic is a very versatile skill, so the more you know about it, the better use it will be to you. Although rarely mentioned, combination runes are the best solution for teleporting around. You can save up to two inventory spaces by having a dozen Mist runes and a Lava battlestaff/runes in place of your regular elemental runes. Once you reach level 97 Magic, you're able to cast all of the spells in the game. Keep in mind that some spells in the Standard spellbook require special equipment (such as the Iban Blast). A handsome reward for those who decide to become masters of the Magic skill. 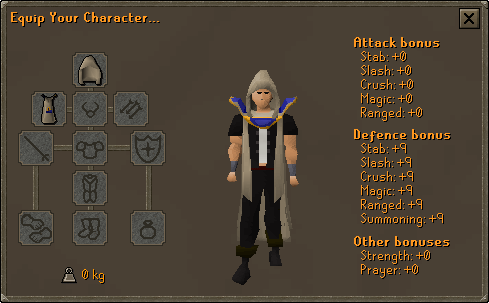 The cape is sold by the robe store owner on the second floor of the Wizards' Guild for 99,000 GP (hood included), and provides a +9 bonus to all defensive stats. The cape also allows the wearer to boost his or her Magic skill to a 100 for a short period of time. Note that this only works while the stat is not damaged (ie. 99/99), otherwise it will do nothing.